Harold Cazneaux is described as "the father of modern photography" in Australia. He was a founding member of the Sydney Camera Circle, a group of photographers in the late 1910s and early 1920s who pursued a change in photographic style. Cazneaux's oeuvre is evidence of this change in representation and approach. His early work is marked by its soft hues and painterly characteristics, as these were the hallmarks of Pictorialism. Later, however, he attempted to portray the unique attributes of Australian light and subject matter, which was a move away from the romantic English inspired imagery that dominated photographic content at that time. In Shadow Play a formal harmony between light and dark is established in the jagged fence line and its corresponding shadows. 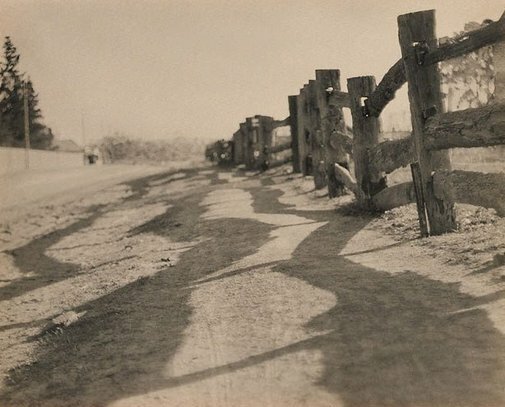 The perspective and angle of the fence are shot in such a way as to figuratively lengthen the image, creating a sense of space and depth. The image is an early and eloquent example of the artist attempting yet another transformation in style: to fuse the soft impressionistic tones of Pictorialism with the dramatic forms and unusual angles reminiscent of Modernist photography. Signed l.r. original mount, pencil "H. Cazneaux". Signed and dated c. verso original mount, pencil "...1920/.... H. Cazneaux". Look , Sydney, Jun 2008, 30 (illus. ).